This entry was posted in Architecture, Buildings, Culture, Life, Odd or Unusual, Photo, Religion, Saudi Arabia and tagged Architecture, business, Islam, Jeddah, living, mosque, Muslim, Religion. Bookmark the permalink. Abu Hanif – It is certainly not my place to remind anyone of anything such as what you suggest. First of all, it is just not my style to act this way. Secondly, if I were to remind people of such things, it would consume my entire day every day, as there are many many things in Islam that Muslims seem to overlook or forget. 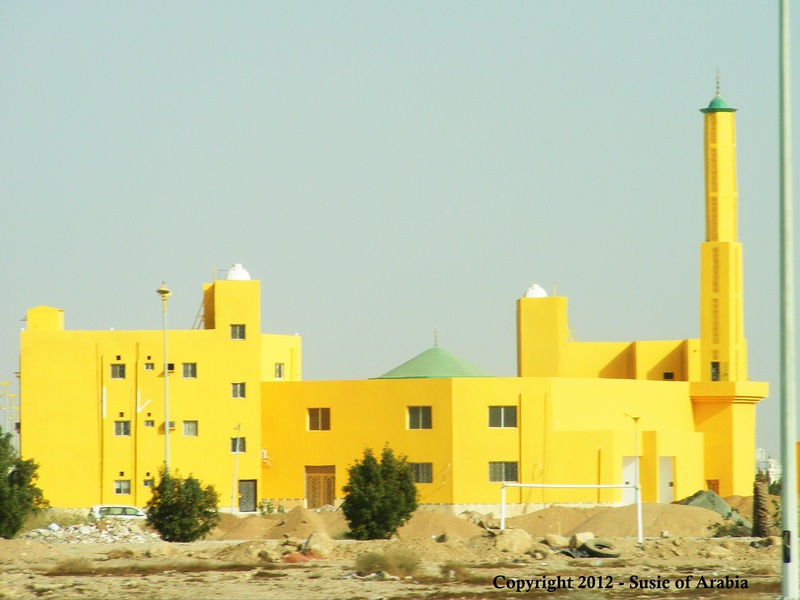 Certainly painting a mosque a yellow color is one of the least important aspects of the religion compared to others… BTW, I read at least half of the link you sent me. It was very boring and repetitive, talking about men who spit on mosque walls. I felt it was a waste of my time. It’s all yellow, sharp angles, and square windows that somehow works. The three brand new mosques I posted this month are all within a few blocks of each other. It’s a booming area near the old downtown area of the city. I am not a fan of yellow for buidings but it might work if some other strong colors were added to the mix. I agree, Jerry – they could tone it down a bit by adding some other colors. That’s so bright it hurts the eyes. I’d rather be on the inside, if it’s not that color. It really is bright! I think once the area is built up around it and they plant some trees, it might tone it down a bit!